(January 24, 2003) -- Bernard 'Boom Boom' Geoffrion was inducted into the Hockey Hall of Fame in 1972 armed with an arsenal of accolades and awards. He was part of six Stanley Cup championships, won the Calder Trophy as the NHL's best rookie in 1951-52, was awarded the Art Ross Trophy as the NHL's top scorer in both 1954-55 and 1960-61, and was named the NHL's Hart Trophy recipient in 1960-61. As well, Geoffrion was selected to an NHL All-Star Team on three occasions, and played in 11 All-Star Games in all. In 12 of his 15 NHL seasons, Boom Boom Geoffrion scored 20-or-more goals, including 1960-61 when he became just the second player to reach the 50-goal plateau. To choose a career pinnacle should be a difficult decision for a player with Geoffrion's extraordinary legacy, but the question prompted a very quick response. "The highlight of my career? Easy. Pulling on the sweater of the Montreal Canadiens for the first time. Winning the first Stanley Cup (in 1952) is close, but wearing the sweater of the team I dreamed of playing for is the highlight of my career." In the era before the amateur draft, NHL teams signed players to C Forms, meaning they then became the property of the team that signed them. 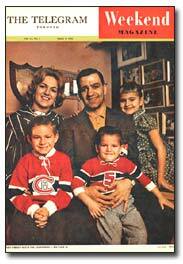 Bernard Geoffrion had signed a C Form as a junior and was therefore property of the Montreal Canadiens. 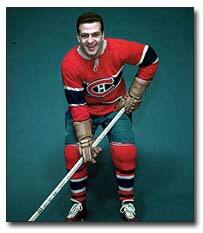 Geoffrion was playing for the Montreal Nationale of the Quebec Junior Hockey League in 1950-51. 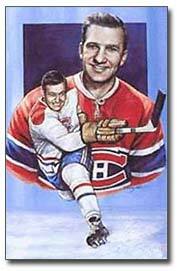 On December 16, 1950, Boom Boom Geoffrion was summoned to join the Montreal Canadiens for a game against the New York Rangers. Sitting in the dressing room at that time were goaltender Gerry McNeil, Butch Bouchard, Doug Harvey, Kenny Mosdell, Elmer Lach, Maurice Richard and another junior called up at the same time, Jean Beliveau. In his very first game, Geoffrion scored, with assists to fellow Hockey Hall of Fame members Billy Reay and Tom Johnson. The game finished in a 1-1 tie. Boom Boom would play 18 games as a Montreal Canadien that season, but still managed to score 98 points in 36 games that season with the junior Montreal Nationale. Kevin Shea is co-author of several hockey biographies. His most recent book is "Over The Boards - The Ron Ellis Story" (H.B. Fenn), released November 2002.